How can I make this style of 2D “glowing” graphics? I'm comfortable with the basics of building a 2d sprite based game in XNA, where all my objects are simply .png images that I move around. What things do I need to learn next to be able to develop a 2d game that utilizes an art style similar to Super Laser Racer for example. 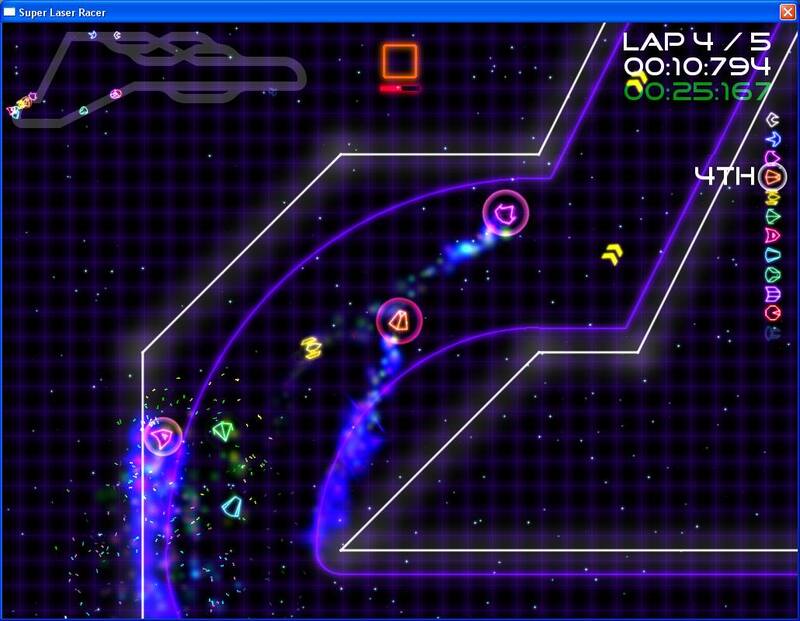 Other examples of this style would include Frozen Synapse, Geometry Wars, etc. I would describe this style "2D abstract glowing geometry" or something like that. I can see that a lot of the effects in these types of games are achieved via particle systems and also that maybe some things are still just sprites that were maybe drawn in a graphics editor to look all "glowing" etc. But then the rest is possibly done by making draw calls to DirectX and implementing custom shaders, etc? Is that right? I'm not really sure of what to learn next to be able to go in this direction or what questions to ask. The simplest way to achieve the effect is to draw a bunch of particles in Additive mode, so when they are superimposed their color values are added up, becoming brighter. One simple method I know of is to render once, blur the result, then render the original, sharp object again on top. This can be done by a bloom filter pixel shader. Not the answer you're looking for? Browse other questions tagged xna graphics graphics-programming special-effects graphics-design or ask your own question. How do you make use of all texture units on today's graphics cards? How to do this sprite motion blur? How to Make A Fast Graphics Engine? How can I make orange/lemon skin normal map? How to achieve this style of view in XNA? Does anybody know of any resources to achieve this particular “2.5D” isometric engine effect? How does code translate to graphics?